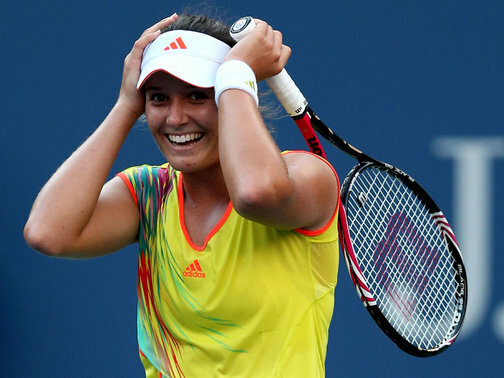 Laura Robson produced a remarkable performance last night as she blitzed past former world number one, Kim Clijsters in straight sets, sending her into a hapless retirement. Clijsters had openly said that she wanted to win a fifth major title before going into retirement but it was not to be, as she reluctantly played her last singles professional match on Arthur Ashe Stadium at Flushing Meadows. It was an emotional affair, as the packed crowd witnessed a historical passing of the old guard to the new, in a display of agile nerve and maturity by Britain’s up and coming youngster. It marks the end of a prestigious career for Clijsters but at the same time cements her legacy as she is transcended alongside history’s great female tennis players. She was an inspirational figure throughout her career, having become the first mother to win a major since Evonne Goolagong Cawley in 1980. She is perhaps best known for her astounding ability to bounce back against all odds and this is especially pertinent to her surge back to number one after a sustained period of absence when, of course, she had her first daughter, Jada. It was a dreamlike comeback for Clijster’s considering what she had gone through in the traumatic years of her break. After her split with fellow professional Lleyton Hewitt she got married to American Basketball player Brian Lynch and got pregnant soon after with Jada. Unfortunately she had to endure the death of her father which probably re-ignited her passion for the sport that she loved so much. However, her comeback was not capped with the glory she longed for, as a supremely in-form Laura Robson sent her crashing out of the US Open, 7-6 (7-4) 7-6 (7-5.) The 18 year old Robson was gliding round the court with competent ease, dispatching fore hand after fore hand. Not only was her movement and agility spot on, but she seemed to find a new found confidence that has always left her in the big points of the big matches. She has a tendency to get frustrated with herself very quickly on the big stage, but she looked stable as she cruised past Clijsters. Once at 30-30, Robson missed 2 easy over-head smashes that she should have put away. In several other matches that I have seen, these misses would’ve destroyed her confidence and she would have likely fallen apart. However, she won the next point to take it to deuce and then eventually won the game. This, for me, is indicative of her growing maturity as a player demonstrating her mental strength that will easily turn her into a force in women’s tennis. She clearly felt genuine sadness for a player that had inspired her throughout her youth but I bet it did not take anything away from her own feelings about her performance last night in, which was, undoubtedly the biggest win of her career to date.